Find out about our latest news and upcoming events. Come along to our monthly Coffee Morning! Every 1st Saturday of the month between 10:00 am and 12:00 noon, families with children aged 0-5 are invited to come along. Enjoy our family friendly environment, have tea/coffee while your children have a play. If you haven’t been to the Babylab before this is a great opportunity to get to know us and the work we do here at the Lancaster Babylab. This playgroup is free of charge with ample free parking available in front of the building. Our next Coffee Morning is on 6th April 2019! Please let us know if you are coming along so we can anticipate numbers and ensure everyone will have a good time. The aim of the conference is to provide an opportunity for infant and child development researchers (prenatal – 4 years old) with a broad range of interests and methodologies, and at various stages of their career, to come together in a welcoming and research-focused environment. Our first conference was held on 25-27th August 2016 and was a success! We will be hosting our fourth conference 21-23rd August 2019 and are already looking forward to it! Amazing world-class health research is happening in homes, hospitals and universities across Lancashire and South Cumbria! The event is packed with entertaining activities for adults and children, experts to chat with, videos and leaflets and fascinating talks. Find out what’s going on in Barton Grange’s Green Room! For World Autism Awareness Week 1st-7th April, our colleagues from Lancaster Psychology have organized a public free event on Saturday 6th April (2:00-4:30pm). This event will be of particular interest to families as well as professionals who work with individuals with autism. Please feel free to get in touch with Dr Calum Hartley for more information. We are very excited to announce that some of our researchers will be featuring in a 3-part documentary on BBC2 called “Babies: Their Wonderful World”. The show looks at the science and psychology behind children’s development over the first two years of life. Last summer our LuCiD summer intern Charlotte Rothwell invited your 6 to 9-month and 12 to 15-month old baby for an eye-tracking study to investigate whether young children prefer to listen to child directed speech rather than adult directed speech. This study was part of the ManyBabies project aiming to compare the results of the same study across different labs all over the world. From around 2000 babies tested across the globe, 32 babies from Lancaster were entered to examine whether differences in the way in which the experiment is conducted, affects the results found. Our PhD student Priya Silverstein is currently running the second phase for this large-scale project here at Lancaster which involves two visits to the Babylab. This is to check whether the same baby will show a consistent preference of speech type. Priya has now written an interesting Blog outlining the ManyBabies project, summarizing first results from phase one and what’s to come next. Auditory information for spatial location and pitch-height correspondence support young infants’ perception of object persistence. Do you remember participating in a 4-month-old study with our researchers Diana and Alison on a green ball moving on a vertical trajectory, appearing and disappearing behind a blue box? Dr Diana Tham, Dr Alison Rees, Prof Gavin Bremner and their collaborators from University of Exeter and University of California has recently published an article which is now available to read. In this study, 4-month-old infants were showed a green ball moving on a vertical trajectory disappearing and reappearing behind another object (blue box). We were interested in the aid of different sounds (no sound, spatially located sound, pitch-height congruent and pitch-height incongruent sounds) in enhancing their perception of object persistence. Spatially located sound is as the object rose (or fell), the location of the sound is moving to the top (or bottom) of the screen. Pitch-height congruent sound is as the object rose (or fell), the pitch of a stationary sound rose (or fell) whereas pitch-height incongruent sound is as the object rose (or fell), the pitch of a stationary sound fell (or rose). The authors found that both spatially located and pitch-height congruent sounds enhanced their perception of trajectory continuity in comparison to no sound and pitch-height incongruent sounds. These results highlight the importance of taking a multisensory approach to infant perceptual development. 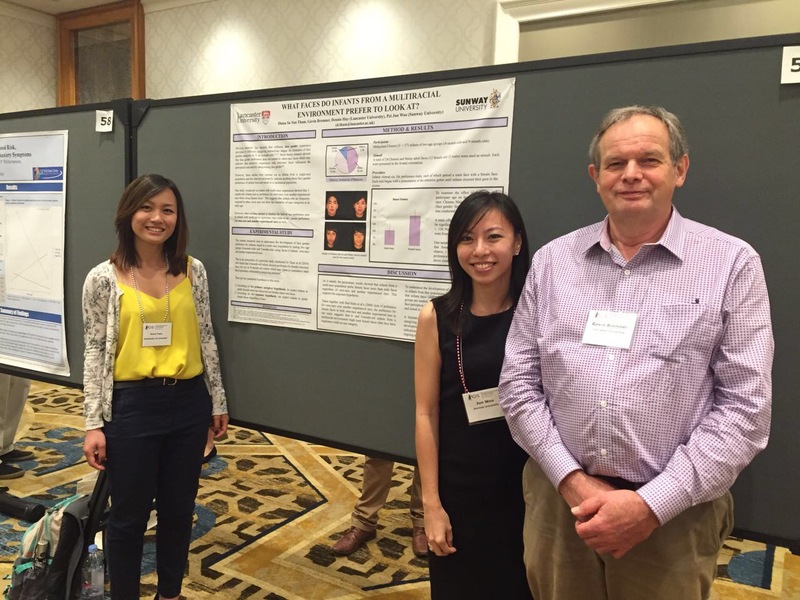 Dr Diana Tham (PI – on the left), Professor Gavin Bremner, and Pei Jun Woo (on the right) have been awarded a Lancaster University grant (£14,938) for their project entitled “A cross-cultural investigation on infant face perception”. This is an exciting collaboration between Lancaster University and Sunway University (Malaysia) and will begin in July 2017 for 18 months. This project will use looking time measures and eye-tracking measures to understand how infants from Lancaster and Malaysia perceive familiar and unfamiliar faces! If you have a 4-month-old or a 9-month-old baby and would like to get involve in these studies, please contact Dr Diana Tham on d.tham@lancaster.ac.uk or 01524 593290. Congratulations to Professor Vincent Reid who was chosen as the overall winner of the Postgraduate Teaching/Supervision Award for the 2016 Lancaster University Student Led Teaching Awards. These annual awards recognise excellent teaching and are particularly notable as the candidates are nominated by students. After being shortlisted by students for his service and commitment to teaching, Professor Reid was selected by a panel of judges as being the overall winner in the category of Postgraduate Teaching/Supervision. The Psychology department is extremely proud of Vincent’s achievement and delighted to have him as one of our teaching academics. 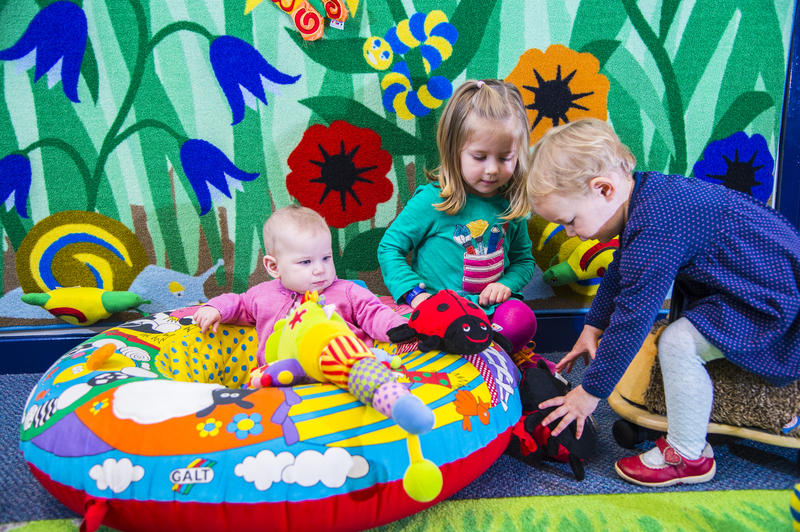 Join Lancaster University Babylab on their journey to discover how children learn about the world around them. 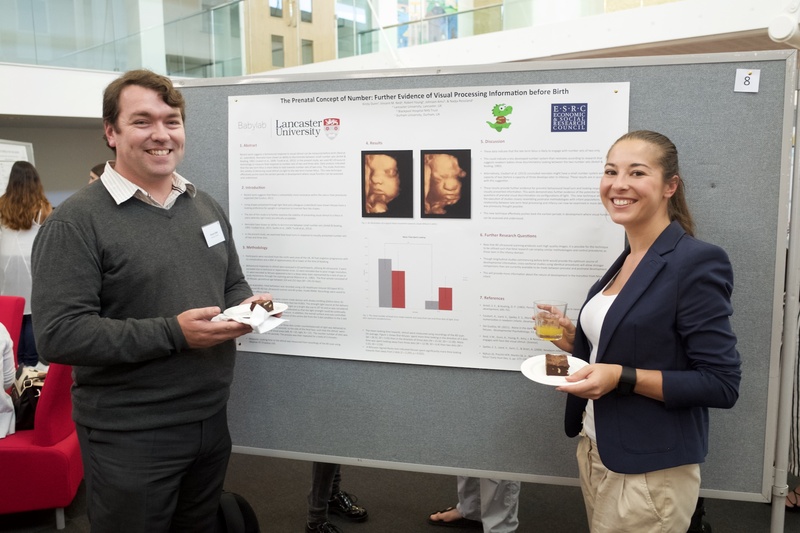 The Babylab Team will demonstrate their recent findings and current research projects, as well as having some of their research methods on display. Why not try our portable EEG to see your brain at work or try our eye-tracker. Come along and also enjoy some Easter Themed family activities with many book prizes to be won! Some of our researchers attended a 2-hour Mini First Aid class covering vital skills such as choking, basic life support, as well as how to deal with burns, breaks and bumps. Of course, we work hard to ensure that none of the above will ever occur here at the Babylab we nonetheless strongly believe that it is vital for all of us to gain confidence and the know how if faced with a medical emergency. We will continue providing this training opportunity to members of the Babylab. 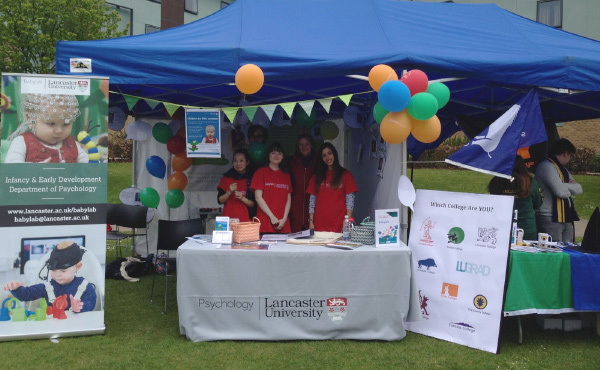 On 6th May 2017, the Lancaster University Community Day, a full day of hands-on experiments, exhibitions, mini-talks, fun and games, food and drink and live music and performance, drawn from across all areas of the University attracted over 2000 visitors. Amongst other fun activities for young and old, the Babylab was able to offer free baby Sensory taster sessions. Babylab will be based at Campus in the City until the end of Friday. Come on down and take a look! Campus in the City is a Lancaster University initiative designed to bring the research and activities taking place on campus into the city centre to engage the local community. The Babylab took part in this event 4th-6th May 2016. 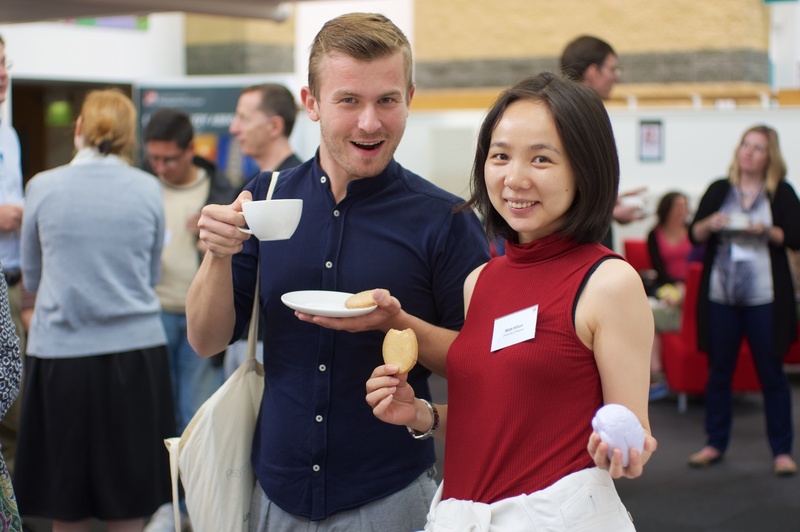 Everyone was welcome to drop in for various fun activities, lovely cups of tea and coffee and the opportunity to chat to our friendly and enthusiastic research team.